Chickens are on my wishlist for the farm. But part of what’s holding me back from getting them is the coop. I know I need to rebuild the coop and part of that is a secure, covered run for our birds. 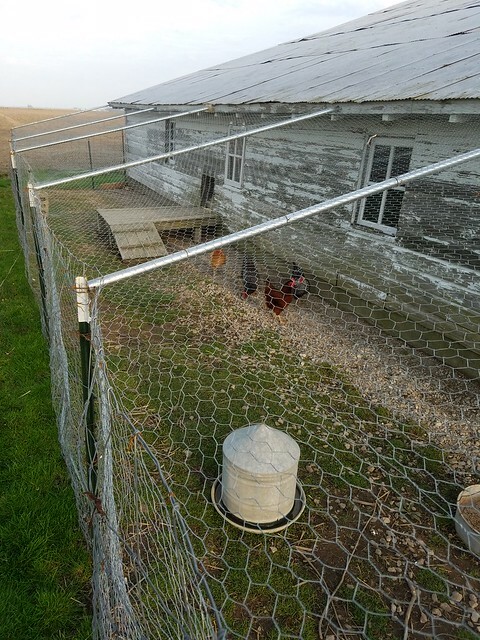 Sarah in Illinois is nearly a year into chicken farming, and she has recently added a run for her hens. She’s sharing that project today, and also looking ahead to a few more. As I mentioned a few posts back, I was concerned with keeping my chickens free range. I loved that they could roam the yard, pick all kinds of greens and bugs and worms and have such a healthy diet. However, Blitz was becoming quite a concern for me. I know very well that it is his natural instinct to chase and catch. I also know that the only way for us to overcome this is for me (and the other members of our family) to work with him constantly, to train him and teach him to leave the chickens alone. 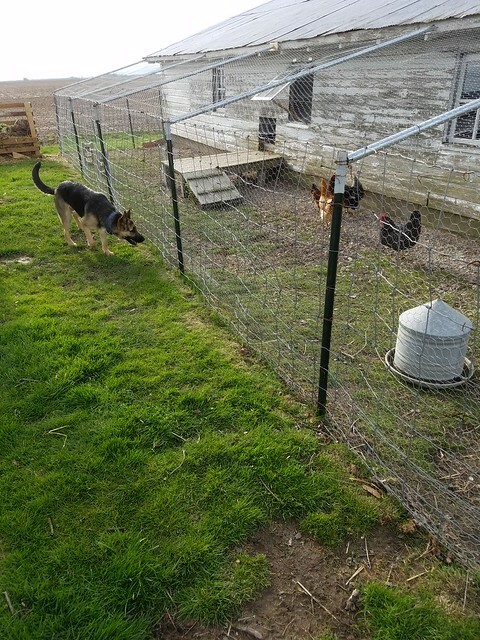 It is still possible for us to achieve this and for Blitz and the chickens to live in peace and harmony, but then Steve and started thinking about how we were going to keep the chickens out of the garden this year and we decided it was time to make a chicken run. We will not get any awards for our design or our building technique but the chickens are safe from Blitz and our garden is safe from the chickens. It wasn’t long after we built our run that I read that Kit over at DIY Diva was building a run for her free range chickens. Unfortunately, she lost a few of her flock before she could get them contained. I am thankful that we only had a very close call with one, and all four are doing well now. 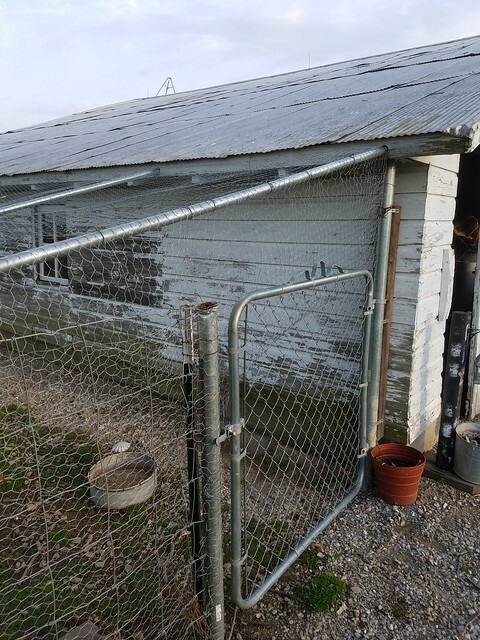 We used part of the existing welded wire fencing to make a run about 8 feet wide and the length of the barn. 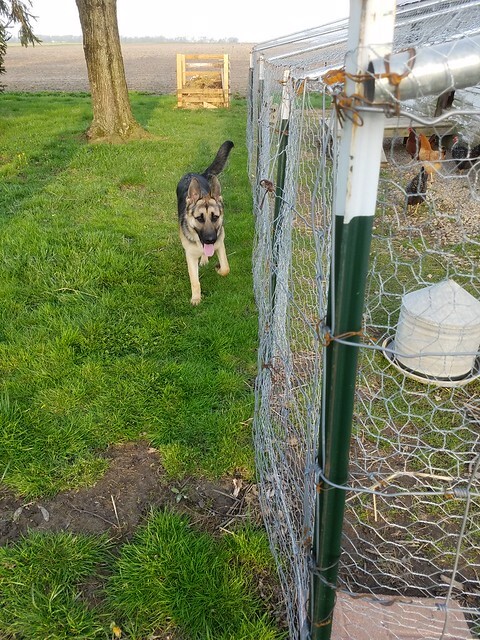 Then we lined the inside of this fence with chicken wire. To support the roof we used old fence poles that we had laying around. We ran the chicken wire over the top and secured all of our seams by twisting wire ties every few feet. Like I said, we did not use any advanced carpentry skills. If we ever get a hungry raccoon looking for a meal I don’t think that our fence will do anything but slow him down. I still make sure to close their coop door every night, and I look over the fencing often to make sure there are no signs of something trying to make its way inside. I don’t recommend our approach for anyone with problems with tougher predators. We did not put anything underground like Kit did. Her approach was much more thorough. It is also possible that we will have to reevaluate everything if we get other predators, but for now it is keeping out one goofy pup. 1. Light box for my mom. She has asked me a few times to make her one and has even sent me pins about it, but I haven’t started one yet. So that will be a good project for rainy days or evenings. A light box is basically a shallow box with a clear or opaque lid. Inside is a light and when you put something that you want to trace on top the light shines through and lets you trace much easier. My mom loves to sew (mostly quilts) and she could really use one. I have pinned one that I am going to base my design on but I need to talk to mom and make sure these dimensions work for what she needs. We need to figure out some type of lighting for around our grill on our deck. I say “we” because Steve does most, if not all, of the grilling, so I am going to have him help me decide what will work and look the best. Right now, this is purely just an idea in my head and I have done no research. For my third project I am not setting a specific project. I am just going to say “garden.” The list of what needs done is so long that I am going to just group it all together and say that any work that gets done in the garden is on my “to-do” list. We increased the size of our garden this year to 68 feet by 64 feet. With the rain we have gotten lately, we are behind on getting our potatoes in the ground. So basically, if I am not working on numbers one and two listed above, I need to be in that garden. I know what you mean about “garden,” Sarah. I actually think it should be “The Garden.” That’s a huge area you have. Between that, the puppy, the chickens and your other projects, you will definitely be keeping yourself busy. Hopefully the run helps to make at least a couple of things easier. It looks like it should do what you need it to. Good luck with your list. Yay! I’m on the list! Haha! Yes, you’re on the list Mom! I think the run looks good! It is too bad they have to be fenced in, but it’s a nice big run. Your garden is enormous! How big was it before? What else will you plant? The chicken run is plenty big for my chickens. If you look on the internet for recommended size for a run, there are many suggestions but a popular one is 10 square feet per chicken. My run is 320 square feet. So even when I add a few more, they will have plenty of room. Although, I really don’t feel that they can have too much room. They seem really happy in it and they explore every inch of it. As for the garden, we added 12 feet by 64 feet. So it was previously 56’x64′. Steve and I had a little confusion when we discussed expanding so it is bigger than originally intended. Plus, we are still going to add a separate bed for strawberries. Yes, sometimes I think we are nuts, but I can’t wait to “dig in”! I plan to add pictures often on my Instagram with the hashtag #walkergarden2017 .